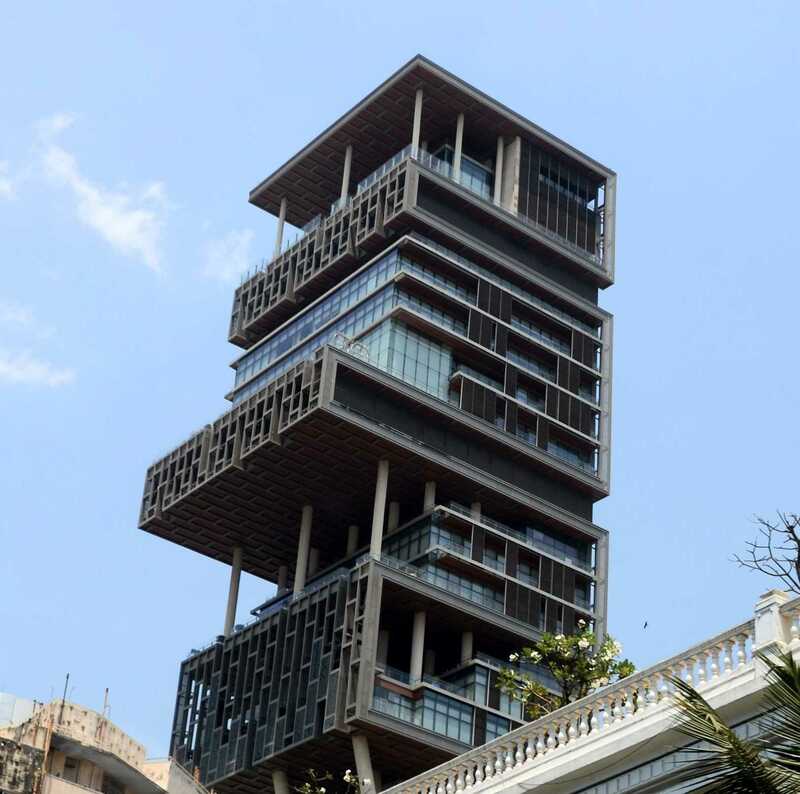 Antilia is a private residence for the Ambani family of six in South Mumbai and it is owned by Mukesh Ambani, the chairman of petrochemical conglomerate Reliance Industries. Antilia was a phantom island which was thought to have existed in the Atlantic Ocean, to the west of Portugal and Spain in the fifteenth century. It would be difficult to find a more blatant example of shameless flaunting of wealth and self serving political influence than the building of this edifice. The location is on Altamount Road, Cumballa Hill in downtown Mumbai (a neighbourhood known as SoBo). Ironically the 4532 sq.m. piece of land was previously owned by a charity operated orphanage and was purchased by one of Mr Ambani’s entities for the equivalent of US$3.2 million at a time when the actual realistic value of the land was thought to be US$22 million. It was reported that the cost of the building project was significantly more than US$1 billion and construction took four years. According to Forbes Magazine, Mr Ambani’s net wealth is currently estimated to be US$42.8 billion. By way of a perspective, in India in 2016, in order to be included in the wealthiest 1% of the population, one would have needed to own assets valued at more than $32,892. Many of Mumbai’s millions of impoverished citizens may wonder at how such a building was permitted to be built in their midst. The controversial design and over-the-top use by one family caused it to become infamous around the world and attracted scathing criticism in architectural articles and has been mocked in popular media. The building comprises 400,000 sq.ft. over twenty seven stories. It is 174m high but because many ceilings are double-height, the building is actually closer to the height of a customary fourty storey building. The building was designed to resist an 8-Richter Scale earthquake. ..The residence requires a staff of six hundred to keep it going 24/7. ..In-house facilities include a health spa, a salon, a ballroom, a fifty seat movie theatre, multiple swimming pools, yoga and dance studios, an ice cream room, a snow room which creates its own man-made snow. ..The building has three helicopter pads. Six floors of motor vehicle garaging which can accommodate one hundred and sixty eight private cars and there is a vehicle service station on the seventh floor. ..One of the pre-design architectural stipulations was that no two floors were to be alike either in terms of plans or materials used. The architectural design has regard for Vastu Shastra, an Indian philosophy which dictates elemental concepts in a similar manner to Chinese Feng shui. ..The building has nine elevators. ..One months electricity bill for the building is approximately NZ$151,000. The Architect is Perkins+Will, a U.S. based architecture and design firm established in 1935 which worked in conjunction with Hirsch Bedner Associates, a U.S. international hospitality design firm headquartered in Santa Monica, California. The construction contractor is Australia based Leighton Holdings (now known as CIMIC Group).